We slept this morning until 8:00. It was raining hard. We decided we needed to do the wash, as we had a washer/dryer in the apartment, but we didn’t have any detergent. I walked to the grocery—getting to be an old hand at going to the grocery store. I got the detergent and some beautiful fresh strawberries. We did the washing and read. We ate lunch at home – ham and cheese sandwiches and a little chicken ravioli from the other night. It was still raining some but we decided to go out anyway. 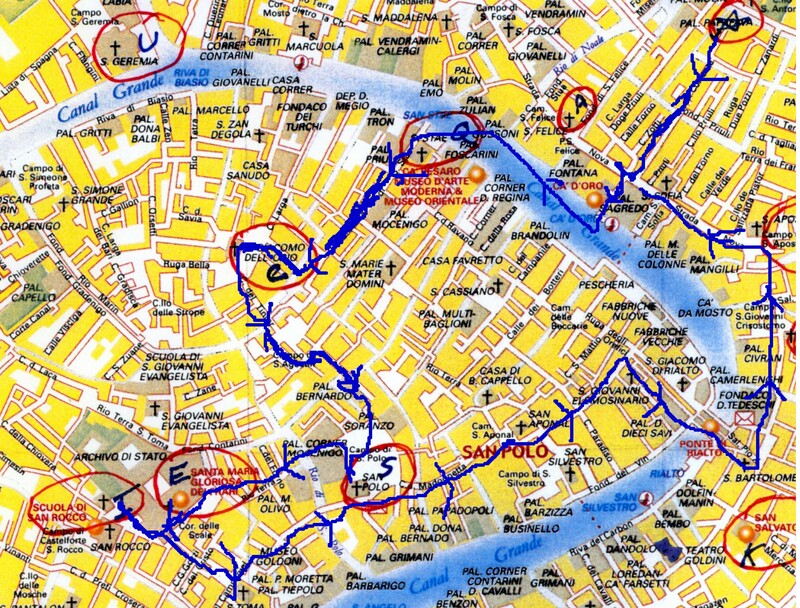 We took the vaporetto in the opposite dire ction – towards the train station and got off at the next stop – S t. Stae ("Q" on the map). St. Stae church was right there. It was built in 1704 and restored in 1977 and was now an art center. 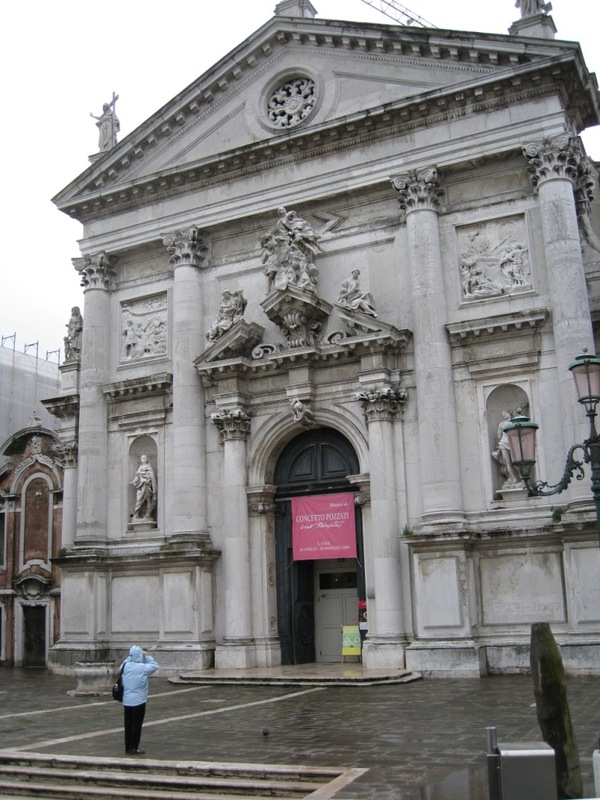 The façade was a Palladio style although Palladio didn't design it. We went in and found it all partitioned off by works of art….mostly modern. It was a very Baroque church on the interior. At the altar end were a number of large paintings on the side walls. 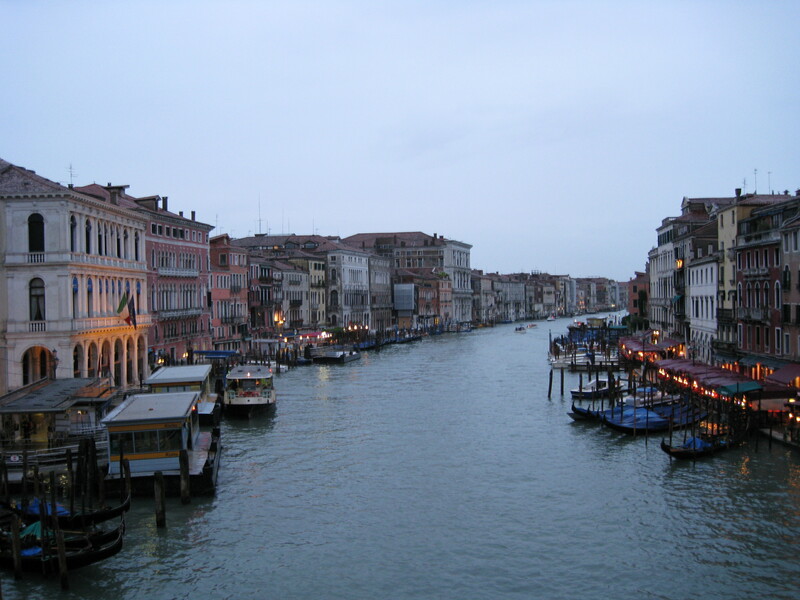 This area of Venice is known as San Polo. From St. Stae we started walking mor e into the San Polo area. 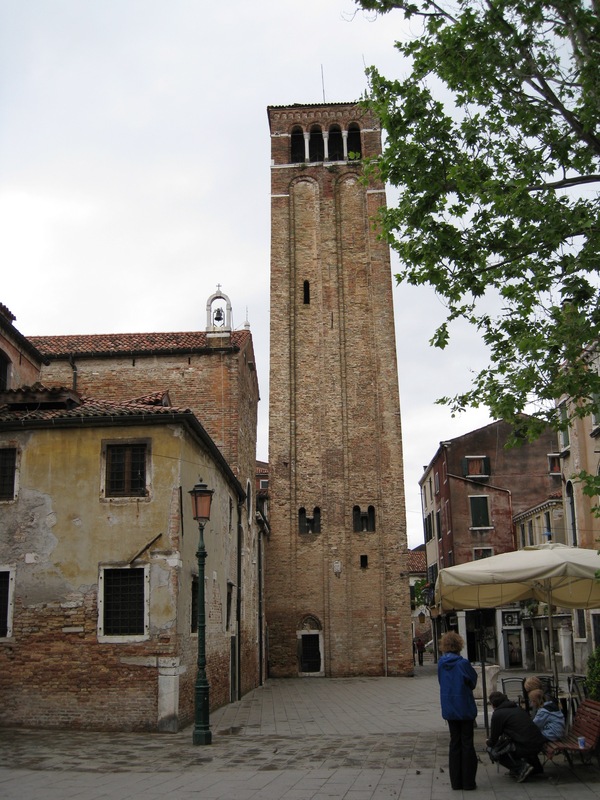 For those who follow the Donna Leon mysteries this is the ar ea in which Inspector Brunetti lives. Our first stop was S. Giacomo dell Orio ("C" on the Map). It was founded in the 9th century and rebuilt in 1225. It was a mixture of various periods. The ceiling of the nave was Gothic ship’s keel roof. 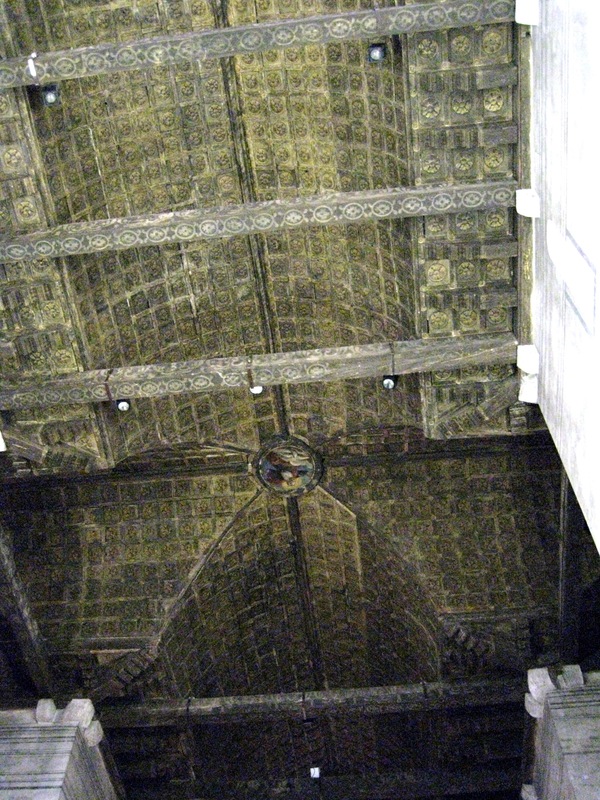 It had wood cross beams and the ceiling itself was individual squ ares. There were three adjacent Renaissance Apses. 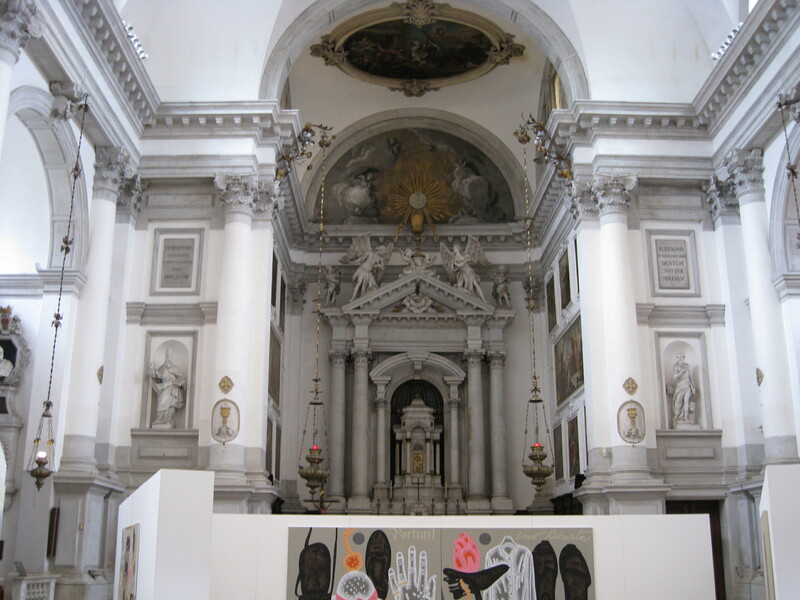 The one on the right was on the inside was the most Baroque, more so than the central aspe. 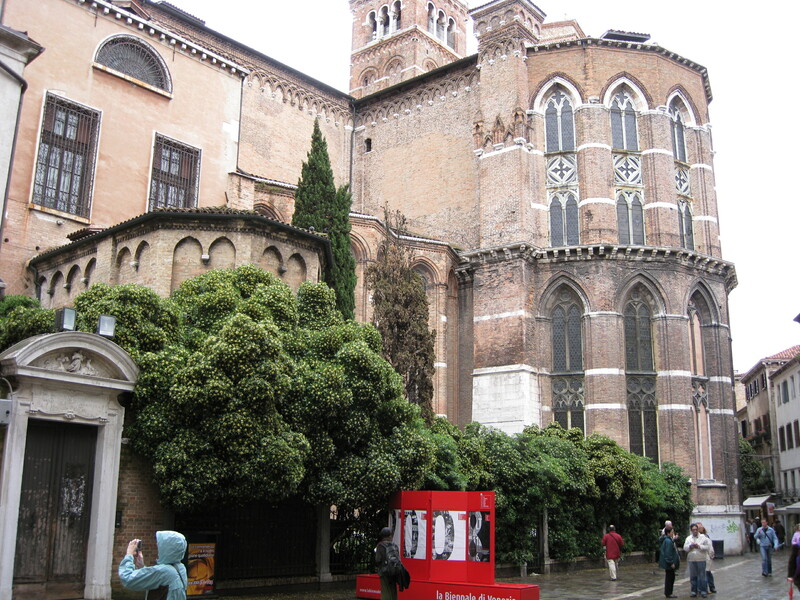 We wandered around, following our map until we came to San Polo Church ("S" on the map). 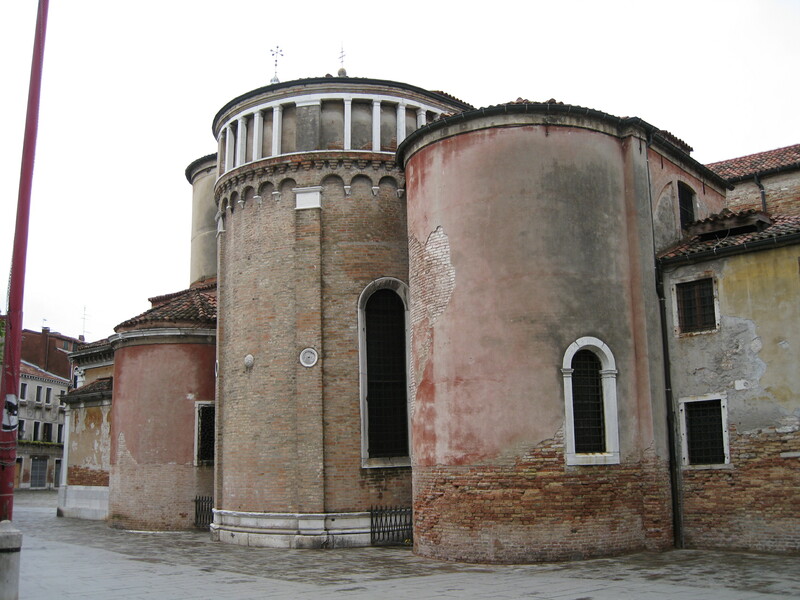 The apse was towards the campo, but the rest of the church was built into other buildings. There was no front entrance, only a plain little side door. 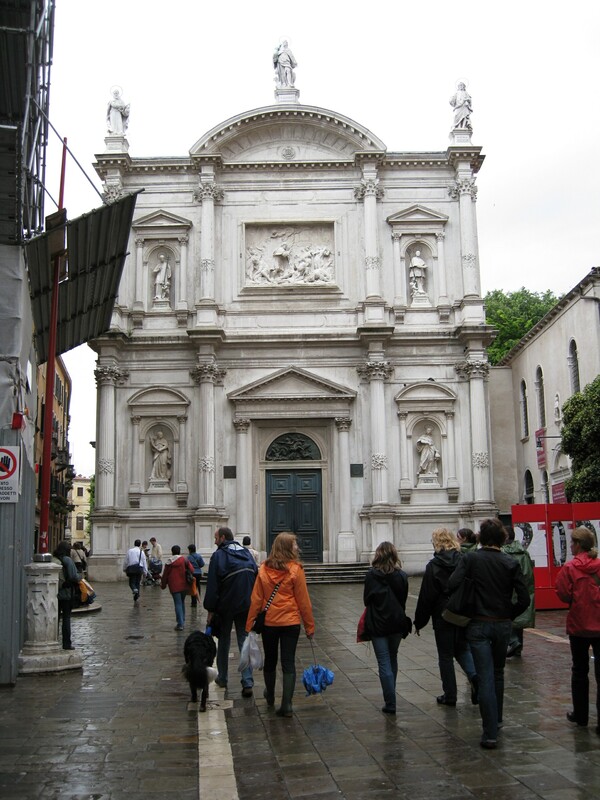 It was founded in 9th century and rebuilt in the 15th and revamped in Neo-Classical style 19th century. It contained works of art by Tiepolo, Veronese, and Tintoretto. It has a wonderful chapel with stations of the cross. We could not take pictures, and they had no books or post cards. So we have pictures of any kind to enjoy. 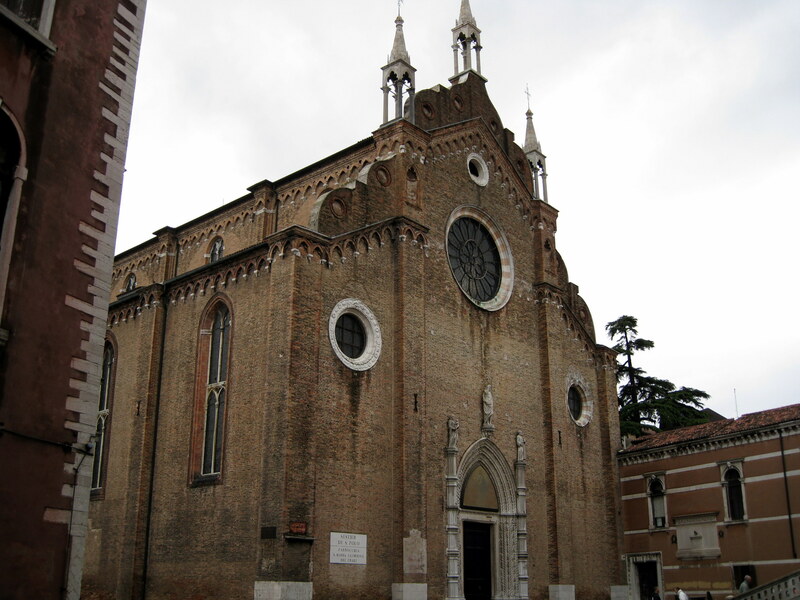 The next stop was Sant a Maria Gloriosa – dei Frari ("E" on the map). It was begun by Franciscan monks 1250 and enlarged 1338-1443. 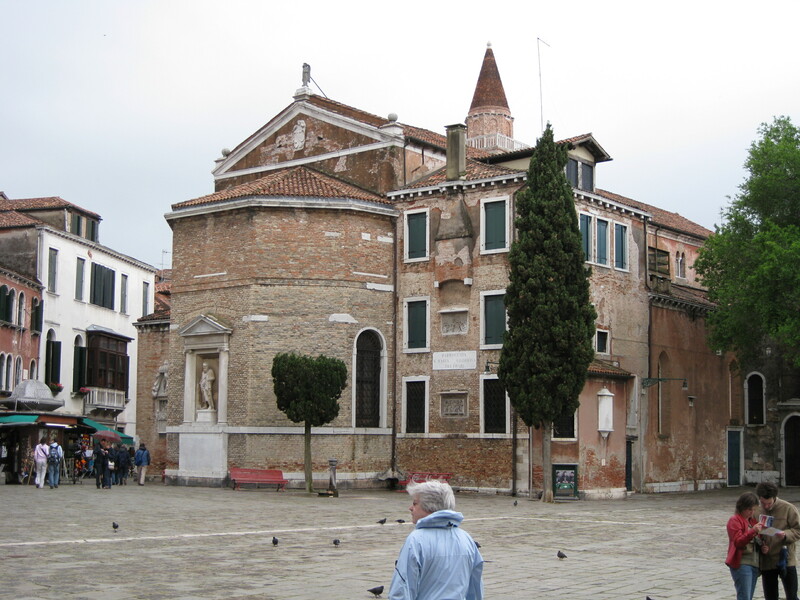 Dei Frari is the largest church in Venice next to San Marco. It contained works of art by Titian, Vittoria, and Donatello. We could not take pictures in there either, but they did have some nice books and we bought one. In the area before the nave were a number of very large monuments to famous donors. One looked like a pyramid. We met a couple from Austin, Texas who were also doing churches. We talked to them for a while. When we left the church, it was 5:00 pm. Behind the church was St. Rocco ("I" on the map) church but it was closed. 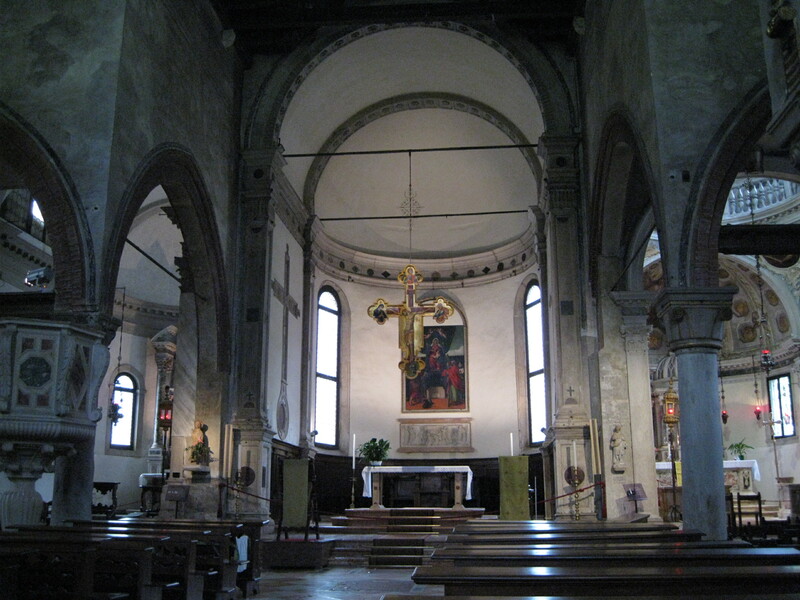 The church was begun in 1489 and finished in the 18th century. It contained the tomb and a famous painting of St. Rocco, a French saint who helped with the sick during the plague. We started to walk back to the vaporetto stop, but found a nice café and had a couple of drinks plus an experience with a pigeon which happened to wander in. I slapped a paper and it got excited and flew over our table and under our feet. The waiter had to get it out. We learned that we should have just ignored it, and it would have gone away. We walked a little further and discovered a nice little restaurant , Osteria al ponte, next to a little bridge. I had salmon gnocchi and liver and onions ---really tasty, almost as good as I make!! My wife had spaghetti and fresh clams and lamb. Even though we were tired we decided to walk back as we weren’t too far from the Rialto Bridge. As we walked across the bridge, we talked to a couple from California who took our picture on the bridge, and we took theirs. On the way home we stopped for gelato. There were several girls from Austin, Texas ordering at the same time. We finally made it home about 9:00. It was a long day with a lot of walking.